I have found–neither gold nor silver, but what makes me unspeakably happy–the os intermaxillare in the human! With Loder I compared human and animal skulls, came upon its trace, and look, there it is. Only, I beg of you not to mention it, since it must be handled confidentially. (WA 4.6:258). The bone whose discovery so elated Goethe, then called the "intermaxillary bone" but now the "premaxilla," is a pair of cranial bones that are located at the front of the upper jaw and bear the incisors in animals that have these teeth. Goethe expresses happiness in finding this bone specifically in humans, a discovery that opposed the prevailing anatomical opinion at the time. In his essay that was finished by the end of October 1784 and later given the title, "An Intermaxillary Bone of the Maxilla Is to Be Ascribed to the Human as well as to Animals." Goethe claims, citing the work of J. F. Blumenbach and Petrus Camper, that the bone has recently garnered attention as a "distinguishing mark" between humans and apes (LA 1.9:154). Yet, upon reexamination of these anatomists' works, I argue that Goethe misrepresents their positions and overstates the significance of his discovery, at least in a certain sense: while Camper and Blumenbach do deny the intermaxillary bone to humans, they do not construe its absence as an important distinguishing mark between humans and animals. Not only did Goethe's discovery not have the significance he attributed to it, but also historians of science claim that he did not discover it all: the intermaxillary bone had already been described in the human by several anatomists before him. It would thus seem that Goethe misinterpreted the significance of what he had not found, and that his unspeakable happiness was unwarranted. However, Goethe's discovery holds another, heretofore-unrecognized significance. I argue that it signals a change in his vision of nature to one that criticizes and departs from the anthropocentric ontology that grounded the natural sciences of his time. If this anthropocentricism is not overturned and the foundation of natural science not reconceived, Goethe maintains, then the study of nature will be indefinitely frustrated, always floundering, and never able to progress. 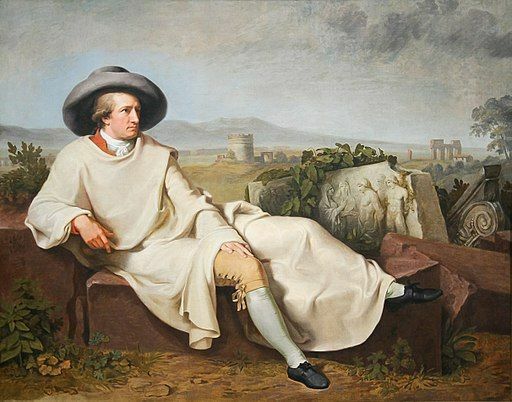 In light of this threat, Goethe reconceives the foundation of natural science by developing anonathropocentric concept of nature that attempts to escape the pitfalls of the human-centered perspective. His concept of nature's harmony, which I argue reflects a nonathropocentric visions of nature, requires the revaluation of the terms in which historians have disputed his discovery of the intermaxillary bone; the originality of his discovery cannot be limited to establishing the bone's presence in humans but must be extended to the concept of nature's harmony complementary to it. Goethe's discovery, I conclude, remains valuable and worthy of the excitement it initially incites in him. I show how it responds to a paradox of contemporary natural science in which the objective methods intended to eliminate anthropocentrism from the investigation of nature surreptitiously reintroduced it to that investigation. Furthermore, I argue that Goethe's nonanthropocentric vision of nature and his criticism of anthopocentricism are applicable to current questions in environmental ethics. By undermining the foundation of anthropocentric ethics, Goethe also challenges the present anthropocentric modus operandi that continues to condone the environmentally destructive anthropogenic activities responsible for species extinction, chemical pollution, and the loss of natural habitats and biodiversity, in addition to other signs of the Anthropocene. The paragraphs above are excerpted from my essay, "Toward a Nonanthropocentric Vision of Nature: Goethe’s Discovery of the Intermaxillary Bone." Goethe Yearbook XXII (2015).